leaves and shoots are edible raw. rhizome can be eaten raw. rhizome can be steeped in water, roasted/dried, and ground into flour. rhizome is suitable for use as a potherb. seeds are edible, either roasted whole or ground into meal/flour. small bulblets can be eaten raw. 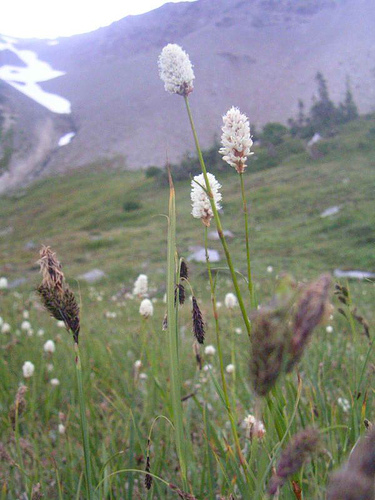 plant is rich in vitamin C.
the variety in Ontario is Alpine bistort (Bistorta vivipara). grows in moist, open areas on montane, alpine, and subalpine slopes. warning: eating raw plants in large quantities can cause diarrhea.